There is a story that George Frideric Handel's magnificent Water Music was originally intended as a peace offering to King George I. In 1710, prior to his ascension to the British throne, the then Elector of Hanover had given the rather vagabond composer a generous position at his court; but Handel never actually fulfilled his duties. After the Elector relocated to London, the composer was more than a little reluctant to face his old master. As the story goes, it was not until 1717, when Handel seized the opportunity to provide some musical entertainment for the King's now-famous barge party on the River Thames, that the composer was restored in the royal eye; George I was completely enamored with the Water Music (asking for the hour-long work to be repeated three times and not returning to the palace until the wee hours) and all past transgressions were immediately forgotten. 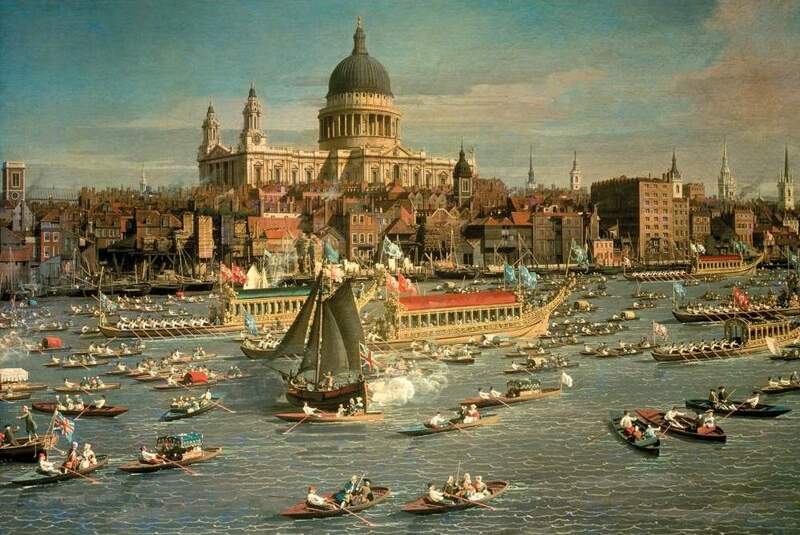 There was indeed a grand party on the Thames on July 17, 1717, during which some of Handel's music (possibly but not definitely the Water Music) was played, but the rest of the story is likely highly fictionalized. It appears that Handel drew upon three already-composed suites of instrumental music, each scored for slightly different instrumental forces, when putting together the Water Music; the Water Music Suite No. 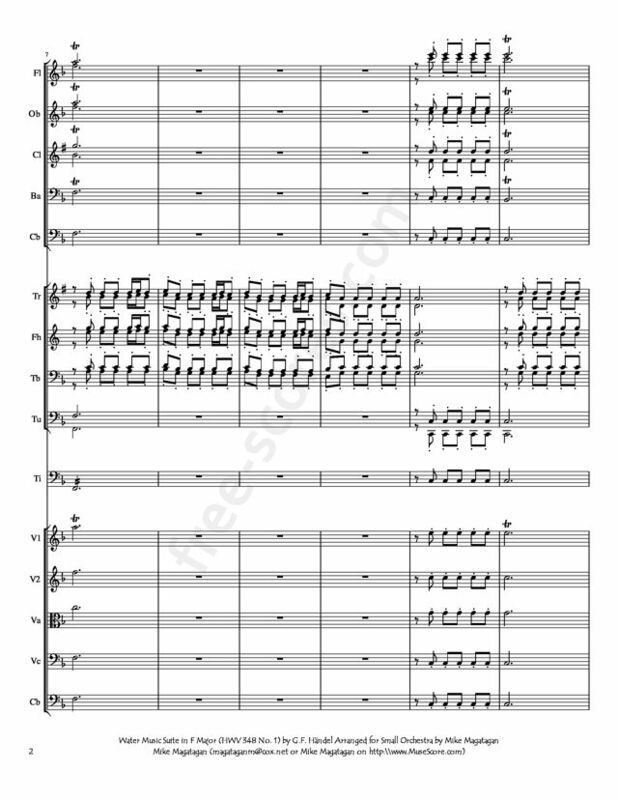 1 in F major, HWV 348, scored for a pair of oboes, bassoon, two horns, two violins, and basso continuo, is the largest of the three, comprising ten more-or-less separate pieces. The Overture that begins the first Water Music Suite is in two large sections. The stately and eminently restrained exuberance of the first and slower section, built entirely out of a single ornamented pick-up gesture, finally boils over into the vivacious, partially fugato, allegro portion of the piece. 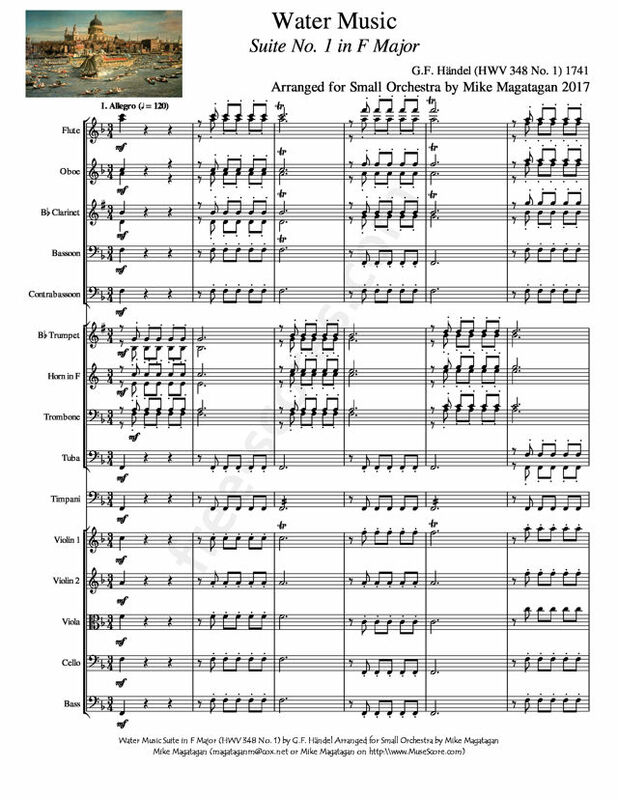 There are two printed endings for the Overture: one ending in a full and rich cadence to tonic, the other climaxing on a dramatic half cadence. Next up is an Adagio e staccato (the heading is apparently Handel's), and then a large three-part movement that moves from an "allegro" (not Handel's heading) built on a regal, fanfare-like, repeated-note motive in triple meter, to a Corelli-derived Andate in D minor and then back to the allegro "da capo." If we count this Allegro-Andante-Allegro as a single movement, there are really only nine pieces in the Suite. A delightful minuet (sometimes called simply Andante or Moderato) precedes the famous Air, which is marked by Handel to be played three times. Another minuet and trio, this time starting off with a robust horn duet, follows. The Bourrée, like the Air, is to be played three times; on the second time around the two oboes take the place of the two violin sections, and on the third the two contingents join forces. After a Hornpipe, Handel finishes the Suite with a substantial fast movement (not titled, but written in ordinary Baroque allegro style) not in F major, but rather in its relative minor, perhaps in an effort to make more seamless the transition between this Suite and the following one in D major (HWV 349). 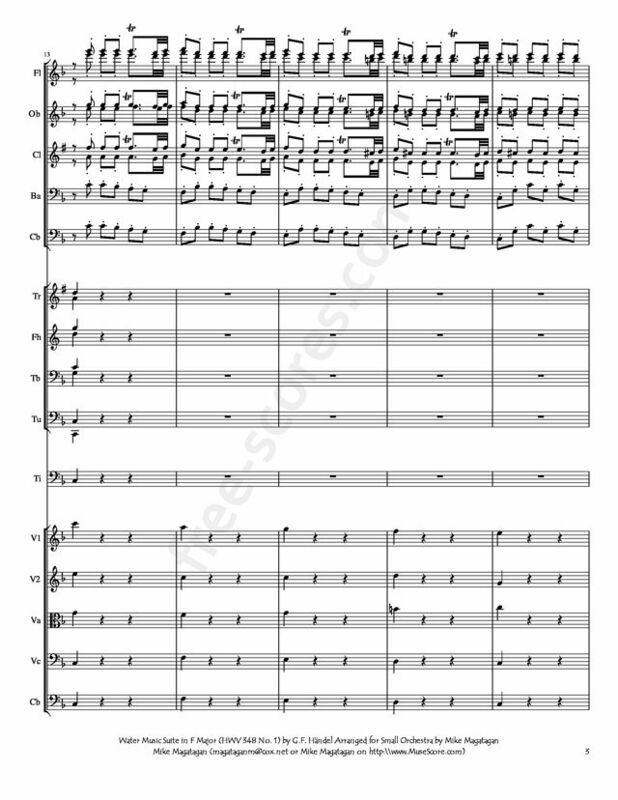 Although originally created for Large orchestra, I created this arrangement of Water Music Suite in F Major (HWV 348 No. 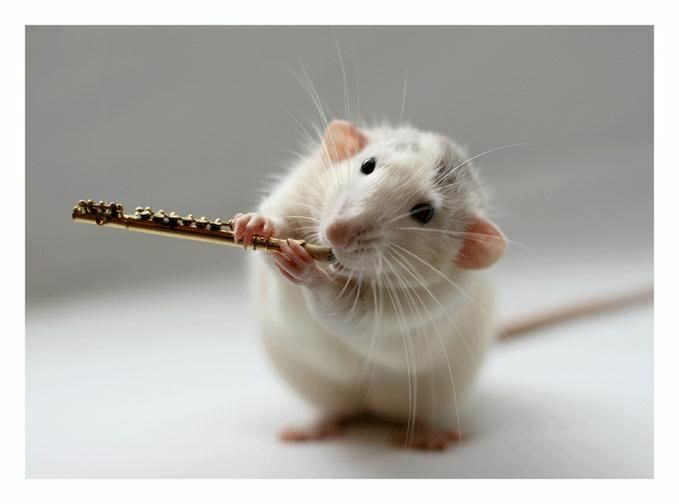 1) for Small Orchestra (Flutes, Oboes, Bb Clarinets, Bassoon, Contrabassoon, Bb Trumpets, French Horns, Trombones, F Tubas, Timpani, Violins, Violas, Cellos & Bass).